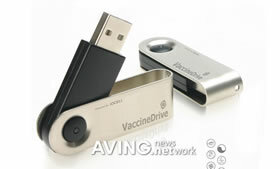 IOCell Korea has launched the Vaccinedrive, the world’s first USB Flash drive with an embedded anti virus engine. The VaccineDrive ensures the integrity of stored data against viruses, spyware, adware and other malicious codes. In addition, VaccineDrive also provides an on-demand scan feature for files, folders, and drives of the computer. It is available in capacities ranging from 512MB to 2GB and it is small enough to fit in your pocket. The anti-virus engine software is embedded in the hidden area of the flash memory and it downloads the latest updates automatically from the Internet, all you have to do is plug the drive. Vaccinedrive’s Anti virus does not conflict with anti virus software already loaded on the computer. It can also detect and remove viruses in Network folder.